Changes from 2018 to 2019. The good news for 2019 is if you are taking a branded drug, your co-pay should be less in 2019 compared to 2018 if you are "thrown" into the donut hole. Increased by $10 to $415 in 2019. Increase from $3,750 in 2018 to $3,820 in 2019. Receive a 75% Donut Hole discount on the total cost of their brand-name drugs purchased while in the Donut Hole. The discount includes a 70% discount paid by the brand-name drug manufacturer and a 5% discount paid by your Medicare Part D plan. 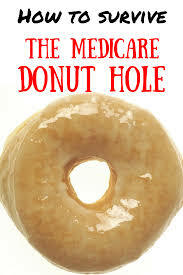 The 70% paid by the drug manufacturer combined with the 25% you pay, count toward your TrOOP or Donut Hole exit point.